The city has lost Vat Chan Street to greed and awful design. 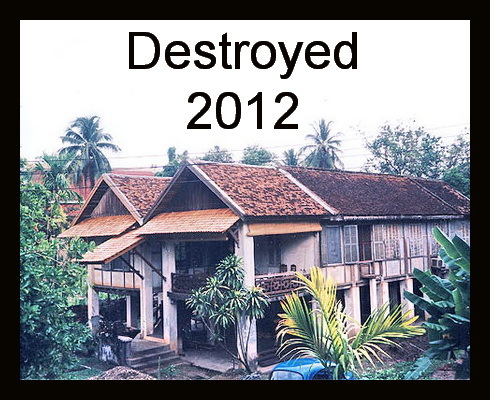 Please help AHL save the last French military building in Vientiane. While we are looking for a new house to add to our portfolio, Mr. Seet and the carpenters are buidling beautiful furniture. In recent months we have built wine cupboards, kitchen cabinets, kitchen islands, bedside tables, and our special 4-poster beds. We are exploring ways to recycle old wooden doors and shutters. Burapha wood is becoming available again after a year or more hiatus. In 2014 three buildings reverted to their owners and with the housing boom, the destruction of old buildings, and the huge real estate bubble, AHL has been mostly priced out of the market. If you know any older buildings that might be available, please let us know using the contact information on the footer below.